News from IPTLD & Dr.Donato Perez Garcia,MD : "Detoxification Week"
WELCOME TO “DETOXIFICATION WEEK”! 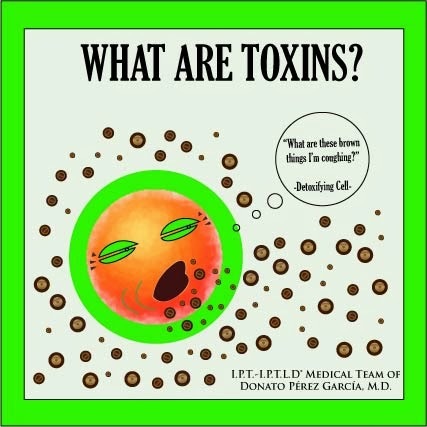 A week devoted specifically to the subject of detox, where our Fans and followers can learn what detoxification is, how toxins have an affect on us, benefits of detoxification, purifying habits that we can integrate into our daily lives, IPT treatments in combination with Detox + Biological Medicine and leveraging the FREEBIE OF THE MONTH by Dr. Donato Perez Garcia’s IPT Medical Team. Join us this week, click, share and view. This week is for you. Warning: This information does not refer to the treatment of drug or alcohol abuse or addiction. Toxins are poisonous chemicals that can harm our body. There are exogenous toxins, which come from our external environment and endogenous toxins, which are generated by the body itself as part of its natural metabolic / physiological waste. Under good conditions, our body is naturally capable of eliminating toxins through its purifying organs, such as: kidneys, liver, lungs and lymphatic system. Whether endogenous and / or exogenous toxins, all humans generate and accumulate toxins. Every day we breathe, eat, drink, spread and generate toxins, which over time, accumulate and if they are not effectively disposed of, can lead to discomfort and diseases. Today’s pace and quality of life has led to a greater accumulation of toxins and a drastic reduction in their elimination by the quality and cleanliness of food, drinking water quality and city air quality. Our hectic pace of life has made us more sedentary, we extensively use many medications and personal health and beauty products that contain heavy metals and other chemicals. It requires great self-discipline, time, energy and money to maintain a body in balance and running in optimal condition. In general, a constant feeling of having an unbalanced body, energy level and vitality. Whoever has a medium or medium-to-high level of toxicity in their body may have one or all of the above symptoms, everyday of their life. Subsequently they may develop chronic diseases requiring the consumption of chemical medications, which in turn weaken and poison the body further. Detoxification (or Detox for short) is a form of therapy that helps detoxify and purify our vital organs. There are many ways to detoxify; there are many treatments and products on the market today that help eliminate toxins and restore the natural balance of the body. In this "Detox Week" we will educate you on this topic and will give some home remedies you can do every day without spending beyond your budget. Note: This information does not include treatment for addiction or alcohol and drugs abuse. Anyone can purify or cleanse at home based on natural remedies and healthy habits. For people with more severe toxicity levels, we recommend a more specialized treatment based on biological medicine in combination with "Insulin Potentiation Therapy" administered by Dr. Donato Perez Garcia. You should not go for extended periods of time without detoxification, and it is recommended that you do them at least 2 times a year. There are people with medical conditions that require medical supervision before, during and after detoxification treatment. The internal cleansing of your body is a habit that everyone should have; it is neither painful nor expensive, when you have the correct foundations and habits well in hand. This "Detox Week" is precisely about that. KNOW YOUR TOXICITY LEVEL: To start the New Year right, the IPT Medical Team IPT is offering you a free questionnaire so you can find out your level of toxicity. Just write to us: info@iptldmd.com , we’ll send you the Toxicity Questionnaire, once you’ve send it, we will email you back a 7-Day Detox Program you can follow from home, completely free. Although commonly associated with cancer treatments, IPT can also be administered to treat various diseases and health conditions, not just cancer. From anemia, rheumatic pain, inflammation, infections to other ailments. In this week’s theme, we're associating IPT as a treatment for mild, medium or high detoxification. Given the nature of the protocol, I.P.T. may better manage any substance administered to cells more effectively and at a lower dosage. The function of insulin causes the cell membrane to be more permeable, which allows the substance (whether drugs, nutrients, etc.) to freely enter and therefore be better utilized for their benefits. In this particular scenario, vials of biological medicine are used to specifically treat the toxic draining organs. It also brings a fine combination of fortifying nutrients and trace elements that help strengthen and drain the lymphatic system. In biological medicine there are treatments to enhance lymphatic drainage which promotes the mobilization of toxins and therefore strengthening the elimination of toxins from the liver and intestinal function. Increasing renal and liver metabolic detoxification. Administered under medical supervision. For cases whose toxicity levels are high, caused by a chronic disease such as cancer or because of prolonged exposure to toxic and / or heavy metal substances, a more specialized intravenous drug detoxification clinical regime, administered by the Dr. Donato Perez Garcia, is recommended. In essence we are pure energy. Once we've removed the excess toxins in our body, our energy and vitality return to their natural state of balance and we fell lighter, productive, in balance with ourselves. A good detox plan, carried out correctly and with discipline, can eliminate many of the above symptoms, and even improve other aspects of our life. There are fewer illnesses, we are less likely to develop new diseases, and we are properly "maintaining" our most precious machine: the human body. Given the environment in which we live and the high levels of pollutants around us, a good detox program should be done at least once a year, but not to exceed 10 days of detox. But there are certain habits that we can include in our daily life that promote a healthy release of toxins and this way, preserve the benefits of a cleansed body.